Every year at USPC’s Annual Meeting clubs are recognized for their dedicated longevity with Pony Club. 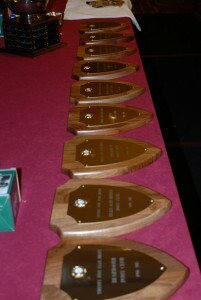 The Club Milestone Award is awarded when a club reaches either its 25th or its 50th anniversary. This year we had a total of fifteen clubs reach a milestone anniversary. During the Meeting of the Corporations on Saturday morning, eleven clubs celebrated their 25th Anniversary by receiving a 25 Year Club Milestone Award. Those clubs include Brazos Pony Club (Rio Grande Region), Grand River Pony Club (Great Lakes Region), Highland Hills Pony Club (Great Lakes Region), Lakefield Pony Club (Lakeshore Region), Midland Foxhounds Pony Club (South Region), Mount Peak Pony Club (Northwest Region), Old Dominion Hounds Pony Club (Virginia Region), Pacific Ridge Pony Club (Middle California Region), River Valley Pony Club (Carolina Region), Silver State Pony Club (Sierra Pacific Region), and Walnut Creek Pony Club (Midsouth Region). Celebrating even bigger milestones, four clubs were honored this year with the 50 Year Club Milestone Awards. 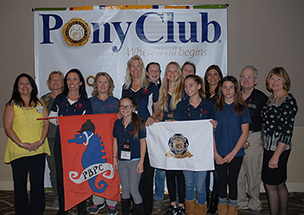 Those clubs include Ponca Pony Club (Midwest Region), Portola Valley Pony Club (Middle California Region), Portugese Blend Pony Club (Camino Real Region), and Racine County Pony Club (Lake Shore Region).